The galaxy NGC 3115 contains a supermassive black hole at its center. 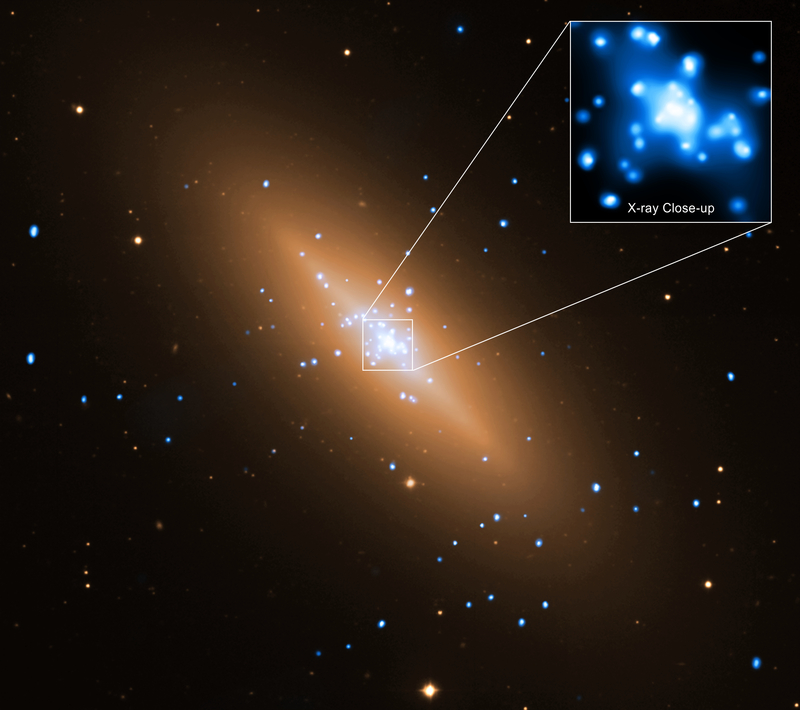 New Chandra data has been used to clearly image hot gas as it falls toward this giant black hole. This is the first time that clear evidence for such a flow has been observed in any black hole. Astronomers observed a critical threshold known as the "Bondi radius" using Chandra. The galaxy NGC 3115 is shown here in a composite image of data from NASA's Chandra X-ray Observatory and the European Southern Observatory's Very Large Telescope (VLT). Using the Chandra image, the flow of hot gas toward the supermassive black hole in the center of this galaxy has been imaged. This is the first time that clear evidence for such a flow has been observed in any black hole. The Chandra data are shown in blue and the optical data from the VLT are colored gold. The point sources in the X-ray image are mostly binary stars containing gas that is being pulled from a star to a stellar-mass black hole or a neutron star. The inset features the central portion of the Chandra image, with the black hole located in the middle. No point source is seen at the position of the black hole, but instead a plateau of X-ray emission coming from both hot gas and the combined X-ray emission from unresolved binary stars is found. To detect the black hole's effects, astronomers subtracted the X-ray signal from binary stars from that of the hot gas in the galaxy's center. Then, by studying the hot gas at different distances from the black hole, astronomers observed a critical threshold: where the motion of gas first becomes dominated by the supermassive black hole's gravity and falls inwards. The distance from the black hole where this occurs is known as the "Bondi radius." As gas flows toward a black hole it becomes squeezed, making it hotter and brighter, a signature now confirmed by the X-ray observations. The researchers found the rise in gas temperature begins at about 700 light years from the black hole, giving the location of the Bondi radius. This suggests that the black hole in the center of NGC 3115 has a mass of about two billion times that of the Sun, supporting previous results from optical observations. 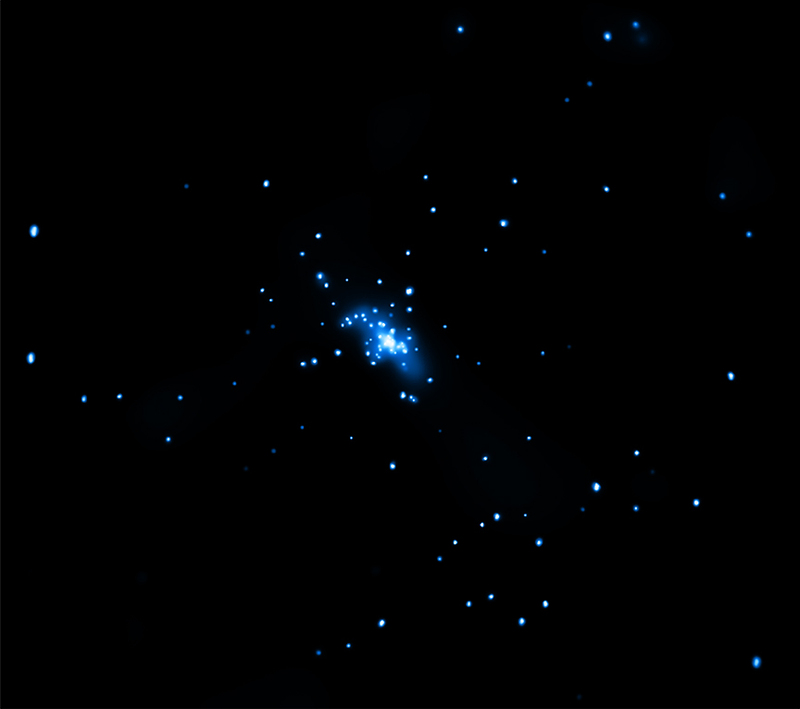 This would make NGC 3115 the nearest billion-solar-mass black hole to Earth. NGC 3115 is located about 32 million light years from Earth and is classified as a so-called lenticular galaxy because it contains a disk and a central bulge of stars, but without a detectable spiral pattern. Coordinates (J2000) RA 10h 05m 13.80s | Dec -07° 43´ 09.00"
There are NO Black Holes, only High plasma focus Plasmoids . Black holes are always interesting but this one is really special and I really liked the part of Bondi-Radius so congratulations for your work Chandra. Superb picture showing the details of NGC 3115. Who should I ask if I would like to use this picture on another website? A lenticular galaxy located about 32 million light years from Earth. About 32 million light years from Earth. X-rays from Chandra X-ray Observatory and optical data from the European Southern Observatory's Very Large Telescope (VLT). About 70,000 light years across.